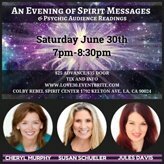 Join psychic mediums Susan Schueler, Julianna Davis and Cheryl Murphy for an evening of messages from your loved ones on the other side. During this healing event you will witness first hand that love never dies and how our loved ones in Spirit are always around. The mediums will also be doing some psychic audience readings and activities too, so bring your psychic questions and sense of humor! Susan Schueler: Susan believes in the importance of improving her gift as a psychic medium and attends Arthur Findlay College in England several times a year. One of the reasons Susan values learning is because she was a high school English teacher for almost 25 years. She holds her BA in English Literature and Theater and her MA in Literature and Women’s Studies. She has spent years in spiritual development circles, where she continues to find new ways to communicate with the Spirit world and improve her natural psychic gifts. Susan Schueler is an ethical and accurate psychic medium with Shay Parker’s Best American Psychics, The Lisa Williams’ International School of Spiritual Development and Bob Olson’s Best Psychic Directory. Julianna (Jules) Davis: Julianna’s Psychic and Mediumistic abilities have been evident since she was a very young child. Many of her earliest memories include experiences with Spirit. She has studied extensively with the highly regarded Arthur’s Findlay College tutors Paul Jacobs, Chris Drew, Mavis Pittilla, and Andy Bing. Julianna comes from a long lineage of Intuitves and natural Mediums, and was raised in a home where Spirituality, Holistic Health and Alternative Healing took precedence. She believes that in order for healing to be most effective it should include a combination of modalities that enhance the body, mind, spirit and soul. Julianna loves to learn and is always looking for new ways to help her own healing process and those she works with and teaches. Cheryl Murphy: Cheryl has studied metaphysics for over 20 years, including international studies in Brazil and Germany, as well as seminars and classes in Colorado. She has oriented her practice as a spiritual medium towards channeling loved ones who have passed over, and psychometry. She is a clairvoyant, healer, and ordained minister, as well as a certified hypnotherapist and an intuitive facilitator. Cheryl has studied Mediumship and Advanced Mediumship classes. She is a member of the American Association of Psychics, an organization where membership is by invitation only. She loves helping people find their inner strength. ***Note: This is an audience reading and not everyone is guaranteed a reading.